Not so long ago we collected together all the military tech we wished we could buy, and a certain US defence agency called DARPA featured heavily with all its experimental military technology. So, when we hear news of a unmanned drone ship that's been designed to hunt enemy submarines, we had one name in mind. 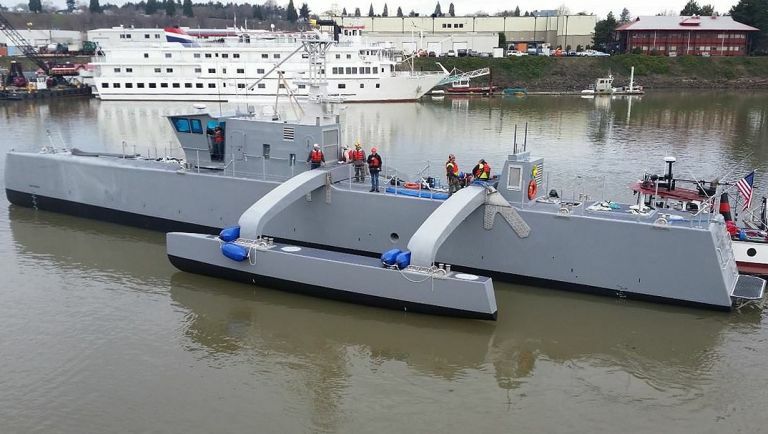 The 13-foot long ACTUV (or Anti-Submarine Warfare Continuous Trail Unmanned Vehicle) was built at one of DARPAs facilities in Portland, Oregon and is currently undergoing speed tests before its official christening in three days time. Those speed tests have been going on for a little while and revealed the drone has a top speed of 27 knots (that's about 31mph), but this autonomous boat will be doing more than just carving waves - it will be mainly using sonar to sweep the waves for rogue submarines that may have strayed into friendly waters. It's not been revealed whether the ACTUV will have any offensive capabilities (and it seems unlikely any weapons will be operating autonomously), but e do know it will follow said detected sub and attempt to spook it away. The vehicle will also be able to deliver supplies to other ships in the fleet and performance reconnaissance missions. Following its christening on 7 April, DARPA will be taking the ACTUV out onto open-water for more rigorous testing before its eventual addition to the US Navy.